In the previous post, we have discussed about isolating traffic using the private VLAN feature at Layer2 level. In this tutorial, we will discuss traffic isolation at Layer3 level using VRF Lite on Cisco routers. VRFs employ essentially the same concept as VLANs and Trunking, but at Layer 3. VRF (Virtual Routing and Forwarding) is traditionally associated with IP MPLS technology whereby an ISP creates Layer3 (or Layer2) VPNs for customers using VRF. Consider a VRF as a separate routing instance (and separate routing table) on the same network device holding the IP routes for each customer which are isolated from the other customers. Each VRF is like a separate virtual router with its own routing table on the same physical router. If you don’t work in an ISP environment you will not encounter this technology very often. Also, from what I know, MPLS and VRFs are not examined at the CCNA or CCNP R&S level. wrote by Luc De Ghein. Now, although VRFs and MPLS are usually configured on high-end ISP routers, you can still use this feature on some smaller Cisco ISR routers in a simplified manner called VRF Lite and have the same advantages. With VRF Lite, you can have separate routing tables on the same physical router device. Each routing table (VRF instance) is isolated from the other VRF instances. Consider the scenario depicted on the diagram above. We have a Cisco 891 border router with an Intranet connection for employees’ computers and company servers and also we need to offer internet connectivity for a Wi-Fi connection to allow guests to connect to the internet. The company security team demanded that the Wi-Fi connection must be totally separated from the local intranet network, so that guests don’t have access to the local network. Therefore we can isolate the two Layer3 networks using VRF Lite. We will create “VRF Intranet” and “VRF Extranet” for the two networks. The router used is CISCO891-K9 with image c890-universalk9-mz.151-4.M4.bin installed. Each VRF Instance will have two Layer3 routed interfaces associated with it as shown below. 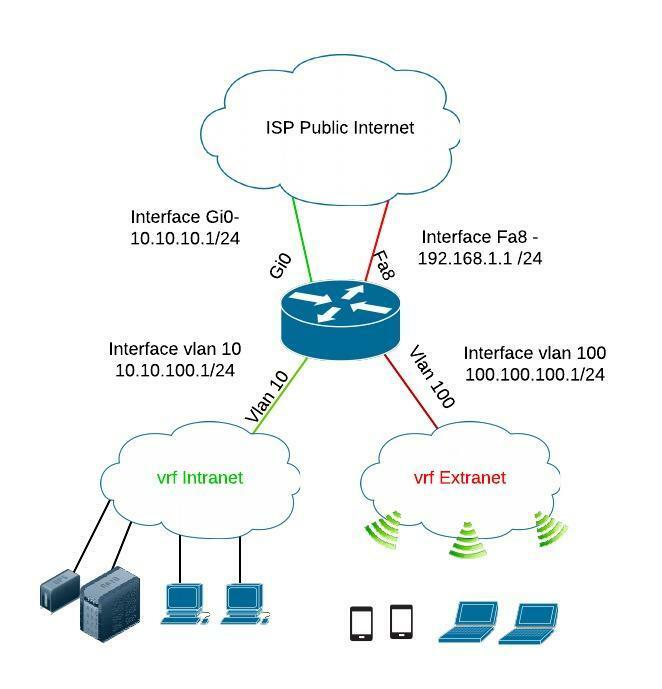 Consider each VRF Instance as a virtual router with two interfaces. VRF Intranet: VLAN10 and Interface Gi0 will be included in “vrf Intranet”. VRF Extranet: VLAN100 and Interface Fa8 will be included in “vrf Extranet”. As you can see, the routing tables are totally separated and the traffic will be totally separated. If you run the command “show ip route” without specifying a VRF name, it will show the “Global Routing Table” of the device (which will be empty in our example above). The VRF Lite feature is offered by other vendors as well. For example in Juniper environment it is called “routing instance”. Many people are asking if the Cisco ASA firewall supports VRF configuration. The answer is that the ASA does not support vrf configuration as there is only a single routing table instance on the ASA. Configure VLAN subinterfaces on the ASA and terminate each VRF network on each subinterface. Then you can apply access control lists and traffic control of the inter-vrf communication via the ASA appliance. Using security contexts: This means configuring different security contexts (virtual ASA firewalls) on the same device thus having separate routing tables and separate policy control for each context. This is similar to having multiple VRFs on the same appliance however its not a native VRF functionality like the one you have on Routers.